writer's conference. When not teaching I had one-on-one mentor appointments with writers who were working out fight scenes. We looked at disarms, blocked movement, played with weaponry and just plain ole' brain stormed. In brainstorming, writers asked for weapons suggestions. A weapon that I suggested several times is one of my new favorites: the jo staff. One of my mentor appointments. a disarm. That's a Nerf gun, btw. This summer I began studying the Japanese martial art aikido. I absolutely love it. In fact, I will do a whole post on it at some point. For now, just know that aikido utilizes several weapons. One of those weapons is a short staff known as a "jo." 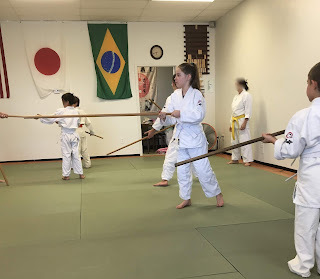 When I first saw the jos on the wall of the gym, I thought maybe they were bo staffs for kids. Nope. They are wooden staffs that, ideally, reach the top of the chest. They are unassuming, fast and deadly weapons. A well wielded jo staff can defend against hand to hand contact, as well as blades of varying lengths. As well, they serve a myriad of purposes and maintain distance from an assailant. A jo fits every size character because the size of the jo is determined by the size of the wielder. It blends seamlessly into a medieval or rural setting as a walking stick or farm tool. And, in an urban setting, if your character has poles within reach such as the handles of a mop or broom, a floor lamp or shower bar, they could easily have a hearty weapon in hand. Take a look around you right now and consider what could be used like a jo. I see balusters of a stair case. (That's the round spindle thingys.) Were one loose, it could be kicked out and wielded like a jo. It would be a bit short, but the wielding would be the same. How does one wield a jo staff? Quite easily. Seriously, if I can learn to use a jo staff, anybody can. The most tedious bit is learning to hold it firm enough to block a strike but not so firm that your arms and shoulders are stiff. Once you get that down, you just learn a couple katas. 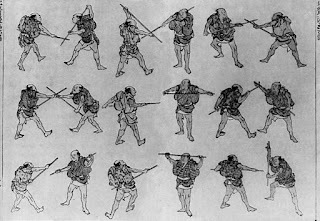 A kata is a choreographed fight sequence. Katas help you learn techniques and understand how different movements work together. For a jo staff, your character can't do a straight out jab then an immediate over head strike. There has to be a transition between the two because the jab extends the staff to its length and the strike comes from above the wielders head. Something has to connect those movements and a good connector is a block of some sort. In the time it takes your character to transition between moves, their assailant can strike so having a block between moves is pretty smart. Here is my sensei, Renato Freire, from Haru Dojo doing kata 13. 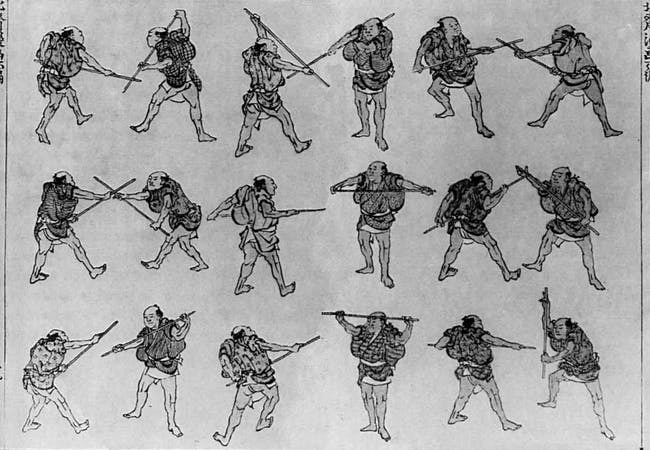 The kata consists of thirteen moves. It's pretty easy to see which moves are strikes and which are blocks. That will help you in your writing because you will see how important a defensive transition is. Movement 10 is a sweep. It targets the ankles and aims to take the assailant off their feet. Pretty cool huh? I highly suggest a jo staff. Next time you are in a hardware store, get them to cut a 1.5" dowel for you about collar bone height. Practice this kata and play with the moves. Link different ones together. Not only will you have a new bag of tricks for your character but a few for yourself. And, look around your town for an aikido dojo. It's a wonderful martial art. If you are in the Houston, Texas area, please drop by Haru Dojo. I would love to have a class so large we have to take it out to the parking lot! By the way, those pants are called "hakama" pants. They obscure movement of the feet. Don't call them a samurai skirt. Folks don't appreciate that. Don't ask me how I know. If you are a fan of the Walking Dead, you know Morgan uses a jo. You will hear it called a bo staff but it is short enough to be considered a jo. Here he is in action. Enjoy. Until the next round at FightWrite.net, get blood on your pages!